Feb. 8 - 10, 2002 -- We've dusted off our boots and put our cowboy hats on straight as we saddle up for our second trail drive to OwlCon in Houston, Texas. "We had a great time last year," said Hawgleg Publishing cofounder Mike Mitchell. "We met a lot of great guys who helped us put the game through its paces. And we had a helluva lot of fun." Like last year, the Gutshot Posee is packing their saddlebags full of loot to give away to some lucky cowpunchers. "I created a new line of promotional products especially for the convention," Mitchell said. The 'Cold Death' product line features a gunslinging hombre coming out of the cold to mete out justice on those who wronged him. "I've always loved that image," said Hawgleg cofounder Mike Murphy. "To me, it's always captured the spirit that we wanted to portray in the game." 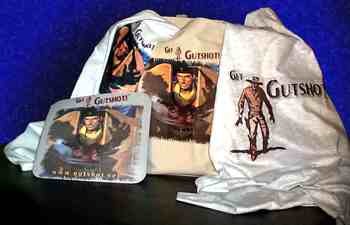 The Gutshot Posse will have two t-shirts, one mousepad, and a totebag, most bearing the new brand. Other prizes and giveaways will include miniatures and possibly a few other surprises. "I think people are going to love these goodies," Murphy added. The 'Cold Death' merchandise, along with the Cowboy Logo designs, are all available at the General Store. You can also sign up online for a chance to win one in February. "If you don't walk out of OwlCon sporting one of our t-shirts, you can still win one in February by registering for our e-mail newsletter," Mitchell said. "We're going to draw one name per month until December, so you have 11 more chances to get Gutshot this year."